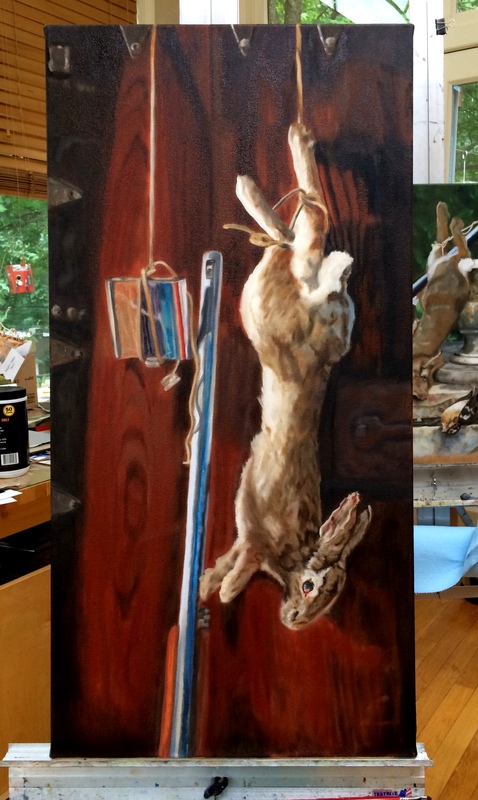 Now that Collateral Damage is set aside to dry, Game Over is nearly done, and the rabbit is coming along nicely, I started the Sweet 16 painting. 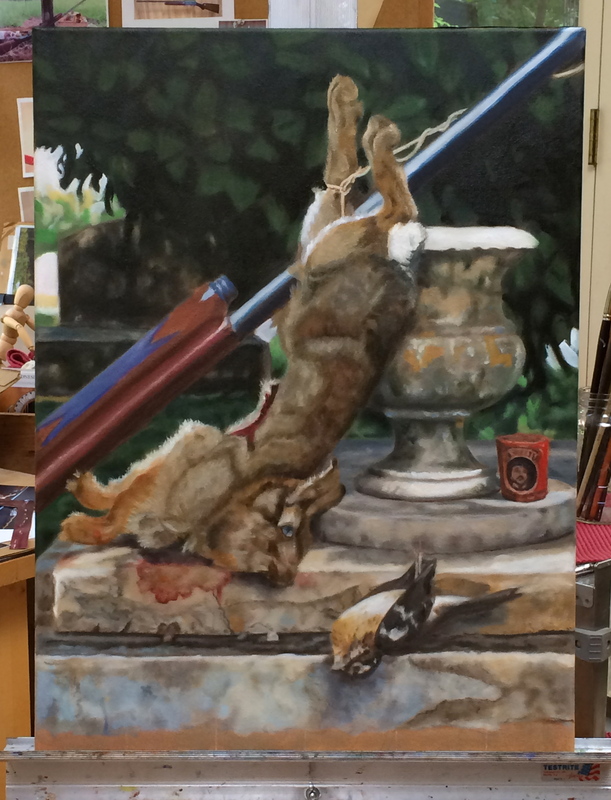 Spent Monday adding a dove to the original composition and mixing paint. 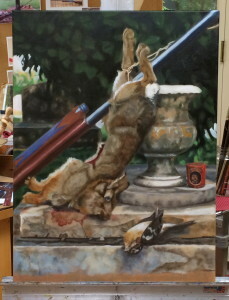 Today I started painting, beginning with the target, then the shadow, and finally the birch-grained background. After five hours of work I put down my brushes for the day. I am going to go look at some larger brushes this weekend. I love this stage, when some shapes emerge, others are barely indicated, and mystery is still a big visual component. Had another great day working on the painting formerly known as Uncle Wiggily, currently called Oakland. Deepened the dark shadows of the shrubbery, the tombstone on the left, and scumbled the urn and marble. 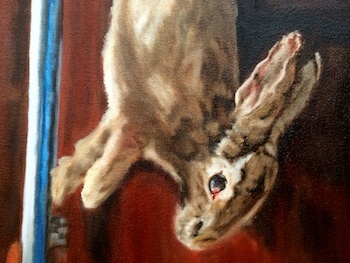 Spent most of the time on the patterns of the rabbit’s fur. Next round, I’ll be painting individual hairs. Good times! In the zone, painting from 9 to 1. Thinking about leaving the bottom couple of inches unpainted. Not sure it won’t make me crazy, but considering it. This painting is one of those rare gifts from the Muse that develops as I envisioned it. No wrong turns or dead ends. It doesn’t fight me, it throws itself into my arms and calls my name. It’s a gift, but it’s not free. It takes a lot of sustained effort, but it is effort that pays off instead of doing a big, fat bellyflop. Tried three variations of cropping on the next painting, that typewriter and gun image. I want the typewriter to be slightly less than life size. It’s angled and there is distance to take into account, so I can’t just measure it and extrapolate. I almost decided, but am going to Kinko’s tomorrow to make one more enlarged image and try it under the acetate grid. Where the ideas for my paintings come from, I don’t really know. I suspect some dark back room of my consciousness, a repository of memory and imagination that seethes and ferments while I am busy doing other things. This is a brief account of the genesis of my latest idea, hot off the griddle. Back in April, I took a photo in the Shakespeare & Co bookstore in Paris of a typewriter on a table in front of a window. It’s in the front reading room upstairs, where I sat for a few hours one morning. I put a cropped version of it up on Facebook the other day as my header photo. The photo includes the mirror on the wall that reflects the shelves of books and a bit of the banquet sofa that runs along the wall under the shelves. I thought about putting a handgun on the table, and/or an empty bottle of bourbon and a broken glass, wadded up typewriter paper, an ashtray with a pile of smoldering butts. 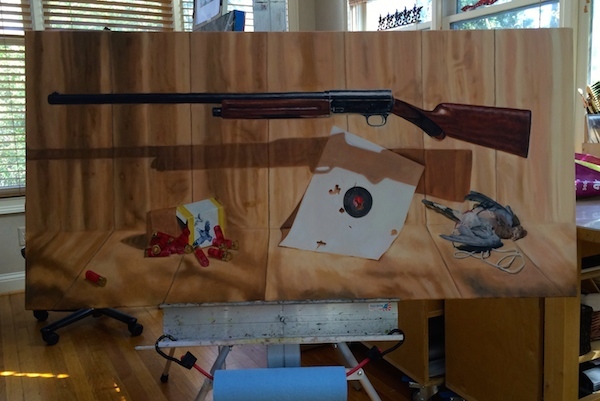 Decided I want to put the shotgun in the painting, on the sofa reflected in the mirror. Not the whole gun, just a bit of it. And not in a blatant way. Something most people won’t even notice. Today I am going to place the shotgun lying on a sofa in the house and photograph it at the right angle and lighting so it can be slipped in. I have a 24×36″ canvas in mind that should be just right. It will bridge the typewriter and the shotgun series. The significance to me is how the sudden death of my father fueled so much of my writing. For everyone else, there’s always Hemingway. 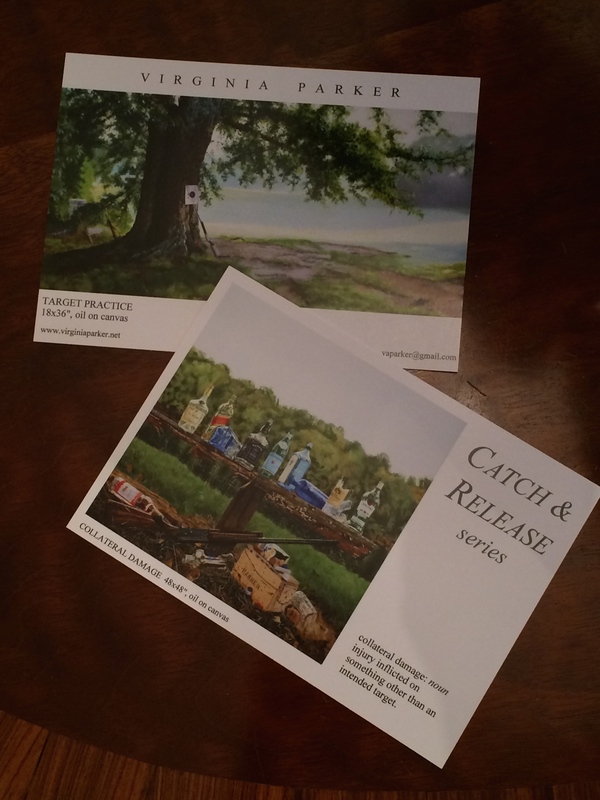 I keep confusing the notes for these two paintings and have just about convinced myself that they should swap titles. Luckily, it’s easy to tell them apart when I look at them. Wednesday I worked on this one – the marble ledges and urn texture, shadows, color, chip and cracks. That kind of thing. Loved doing it. 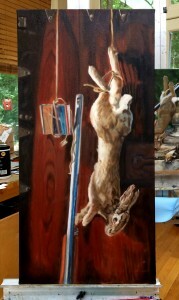 Also added the bit of jute twine that ties the rabbit to the gun barrel. Did more detail on the votive candle, which I bought in San Miguel de Allende years ago. This morning was an impromptu jaunt in a time machine. I picked up my palette knife and started mixing color at 9-ish. When I put down my brush, after what I thought was a couple of hours later, it was 1pm. I covered the background with another layer of dark browns and reds, brought up the bottom edge and narrowed in from the left. Made patterns of neutrals in the fur. The most focus was doing the rabbit’s eye and the ears. After a morning at the gym and running errands, I painted while the thunderstorm rolled through in the afternoon. 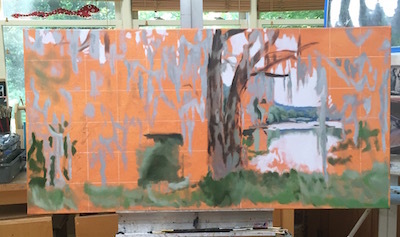 One of the good things about a canvas this size is there is always an area that’s dry enough to work on. 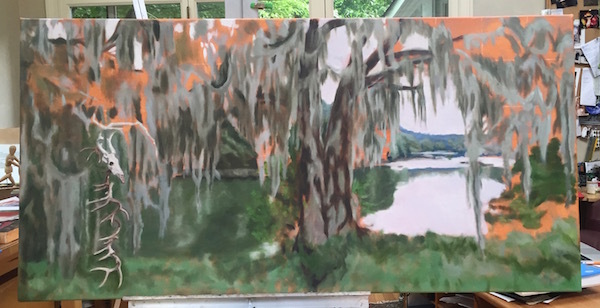 Adding another layer of dark green water and the ochre-toned tree reflections, plus the froth of the current. Thinly highlighted the edge of the wood bench that’s silhouetted against the water. Added grain and texture to the upright piece of wood. 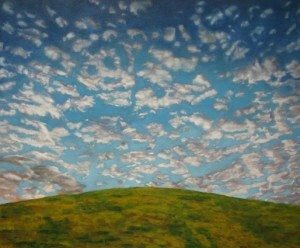 At the end of the day I scrubbed the last traces of dark green from the brushes on the meadow area, to vary the value. I’ll build pale,individual grass blades over that. Clusters of tall grasses will overlap the dark river, and the odd scallop shapes along the top edge will disappear into them. 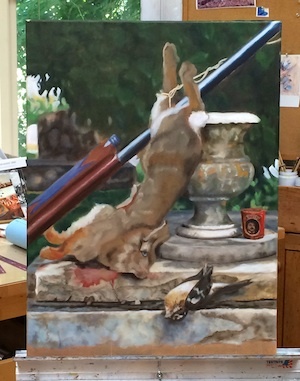 I am struggling with the pheasant painting. It reminds me of the editing phase of writing: having to ‘kill all your darlings,’ as Faulkner famously advised. Many a time I had to cut entire sections that meant a lot to me but just didn’t work for the story as a whole. The harder I struggled make it work, the worse it got. 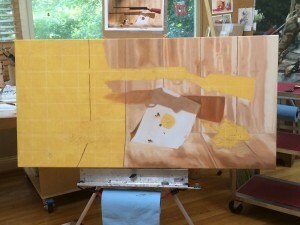 Right now I want to throw that bird painting in a dumpster, I’m so frustrated with it. I won’t, because I might have some kind of breakthrough, some way to alter the emphasis of the light. Hey, it happened for the big cloud painting. Two years after I gave up and turned it to the wall, I added the hill and it all came right. 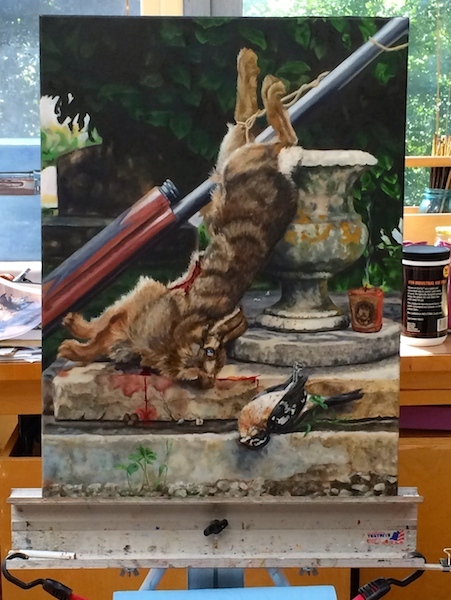 For now, I’m bailing on the birds instead of spinning my back wheels, and starting one of the gun suspended over a target with shadows, and another one that’s a close up of the gun leaning on a massive oak tree trunk.